Few would be surprised to learn that that global food production has an adverse effect on our environment. Farming today occupies a significant share part of the world’s land (about 40 percent) and impacts the environment in several ways. Agricultural nutrients leaking into the sea contribute to eutrophication, the overuse of crop protection products adversely affects plants and animals, and land use contributes to erosion and soil degradation. All three have an effect on biodiversity. In addition, the majority of all antibiotics used globally are used for healthy animals. Such heavy use contributes to the development of antibiotic-resistant bacteria. We humans also eat an increasingly narrow diet, where only four raw materials – wheat, corn, rice and soy, grown in huge monocultures – make up two thirds of the global food supply. It is estimated that 25-30 percent of global greenhouse gas emissions come from agriculture. Emissions include nitrous oxide and carbon dioxide released from arable land and mull, methane from livestock, greenhouse gases from manure and the treatment of acidic soils, and carbon dioxide from agricultural machinery and transport. More initiatives are needed to change the system. One problem is a lack of cooperation in the food chain. In response, our project at Torsåker Farm brings together farmers, scientists, food producers, cooks and contractors to meet and make progress together. The farm itself lies some 30 kilometres north of Stockholm and is Axfoundation’s development centre for the sustainable food production of the future. The farm serves as a catalyst for the advancement of Sweden’s future sustainable food production. Torsåker comprises arable land, forests, meadows and a restaurant kitchen, which affords us the opportunity to test, nurture, process and develop new methods, new foods and new meals together with others. We believe that meetings between people with different skillsets are needed to make tomorrow’s food products both better and tastier. At Torsåker, we want to be where sustainability, nutritional content, and taste overlap and reinforce one another. We also want Torsåker to stand at the intersection of research and trials and to test the things that the farmer, the market or anyone in between, does not have the time or sufficient knowledge of to do themselves. The needs are huge, and we represent a tiny island in a vast ocean. Yet, by being open and doing things together, we hope and believe that Torsåker can make a difference. While there are many ‘think’ tanks out there, we want to be a ‘do’ tank. If we want to meet our climate targets, we must decrease our consumption of animals. Six kilograms of plant protein go into making each kilogram of animal protein, and the majority of arable land is used for producing animal feed. This means that we can get significantly more food out of each hectare if the crop goes towards making food rather than animal feed. As the world’s population grows, food shortages are not inevitable, but we have to eat differently. Different in a way that benefits the climate. If it also makes us healthier, it is a bonus. In Sweden, we need our cows to graze on grass and maintain the open countryside and their meat has many beneficial qualities. Sadly, nearly half of all the meat consumed in Sweden is imported and often raised on concentrates. 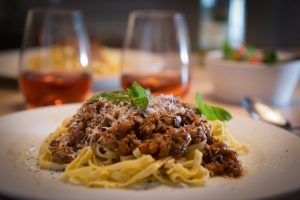 The growth in popularity of alternatives to meat and dairy is high, which is positive. However, most of the meat and dairy products are made from soya, a great crop from a nutritional perspective, but which is often cultivated in other parts of the world and in a way that damages both nature and people during production. It is difficult to grow on our latitude. We invite researchers, farmers and cooks to Torsåker Farm to gather, grow and use protein crops that work in Sweden. We want to find good and sustainable food alternatives to meat, as well as reduce our dependence on imported soya. Is sweet lupine the Nordic soya? Sweet lupine (not to be confused with the poisonous garden lupine) has long been cultivated and used as food in the Mediterranean and South America, among others. In recent years, usage has increased in Australia, Europe, Russia and North America. The pea-sized lupine bean has a complex structure of nutritional and high-protein content, which means that it resembles soya, but with the important difference that it can grow in our climate. Like soya, lupine is a legume, so therefore capable of taking in nitrogen – a nutrient that all organisms need to function – directly from the air. The fact that it does not require nitrogen fertiliser is a major environmental benefit. Its long roots go deep into the ground and they allow the plant to grow while holding it firmly in place. This helps prevents erosion and nutrient leakage. 250,000 tonnes of soya are imported to Sweden every year and most is used for feed for dairy cows, pigs and poultry. 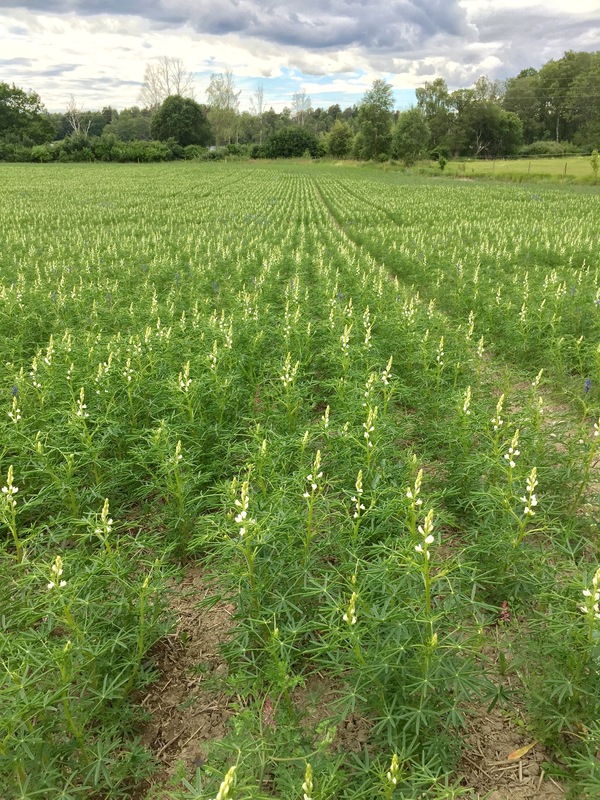 Together with some cooperative farms, including a pig farm, a dairy farm and a chicken breeder, we have grown sweet lupine and tested it on livestock. The pig farm, which replaced imported soya with self-produced lupine and broad bean, saw that the pigs grew at the same rate as on soya and felt healthy. At a dairy farm, another type of lupine was given to the cows. Again, no negative impact was noted in either the animals’ well-being or the volume of milk they produced. Even the chickens raised on lupines grew well and enjoyed good health. In refined form, the sweet lupine has enormous potential as a plant-based protein source, as it can be used in numerous foods. Together with chefs and other actors in the market, we are now exploring possible uses. One specific result is a new product, a plant-based mince consisting of sweet lupines, broad beans, field peas, rapeseed and salt. 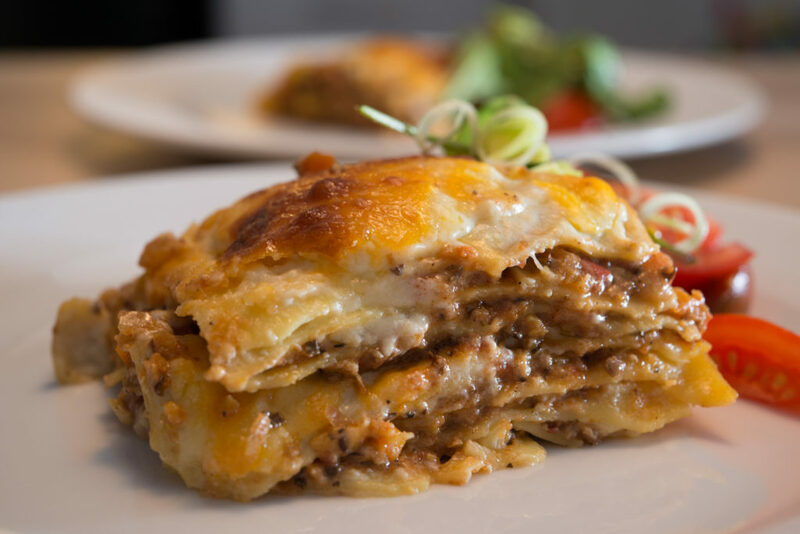 To test the product, it is currently being sold in the form of lasagna and bolognese in all Urban Deli stores. 5% of the sales price goes to research and innovation into Swedish legumes. Read more here. We tested the mince on 350 school children in Södertälje, near Stockholm. In co-operation with MatLust, the school cooks made tacos with the mince and, according to the results of the survey the children filled in after lunch, it could have a bright future on schools menus. 85% of the world’s fish stocks are overexploited and fish farms are seen as an opportunity to provide the market with enough seafood. Today, about half of the fish on the market is farmed. However, large numbers of wild fish are used in conjunction with soya as feed for the farmed fish. Global fish farming therefore contributes negatively to global food supply. Since the use of insects in fish feed was granted in July 2017, the potential to solve the problem came about at the same time as an unused raw material in the form of food waste is consumed. The food production system has major problems with waste and the recycling of nutrients, and they become contributors to the leakage and eutrophication. Less than half of the waste produced today is treated, and when it is it is done so in ineffective systems for the management of nitrogen and phosphorus. Together with the Swedish University of Agricultural Sciences, fruit and vegetable supplier Grönsakshallen Sorunda, grocery store company Axfood, and fish producers Älvdalslax, Torsåker operates the project ‘Five Tonnes of Green Fish in a Dish’ with the aim of developing a circular system for producing Swedish fish feed. The reason is that vegetable residues such as shells and kernels are processed with insecticides and so become food for insects. These, in turn, are processed into food for fish. The larvae produced, together with other indigenous raw materials, could replace today’s use of fishmeal, fish oil, cereals and soya concentrate. When EU regulations extend beyond allowing insects to only be used for fish feed, more substrates and animal species will be able to benefit from the process. This will further contribute to the development of a sustainable society, circular food production, and increased profitability. The 100 million chickens born in Sweden each year consume around 350,000 tonnes of feed. About 15 percent of which is imported soya. In connection with Torsåker’s fish feed project, we also tested insects for chicken feed. Giving the chickens live insects stimulates their hunting instincts and seems to help reduce the number of cases of hacking. The larvae can also consume bacteria in the birds’ faeces thus making the bedding less corrosive to their feet. Together with some Swedish small-scale poultry farmers, we developed a three-way approach focusing on health, taste, growth and resistance to predators. The joint approach is based upon the breeding of living insects at Torsåker farm. In addition to testing the feed, we want to raise the question of whether it is possible to ethically, economically and in an environmentally sustainable way, feed a healthy, fast-growing Swedish chicken breed that also tastes nice. This as opposed to the extremely fast-growing chicken breeds that today make up most of the those sold in Sweden. A comparison of full-sibling chickens has shown that Torsåker’s chickens grow 25-30 percent faster than those that have received conventional feed. This indicates that it is economically viable to give chickens insect feed. So far, it is not allowed to sell food birds that are raised on insect feed, but we hope that will soon change. In addition to producing protein and fat as they grow, larvae produce a high-potential fertiliser when they process organic waste. This fertiliser is currently being evaluated on Torsåker Farm, where a land used to grow vegetables is being fertilised with insects. Thanks to relationship with star sustainability chef Dan Barber, from New York, we obtained seeds from vegetables that have been refined for years, rather than through natural distribution. These seeds were planted in insect mush on Torsåker and the first crop far exceeded expectations. The vegetables have now been distributed to some of Sweden’s finest restaurants for evaluation. We also conducted a bold research effort where we cultivated the same crop in mineral fertilisers, organic commodity fertilisers, and insects to evaluate whether there is any difference in micronutrient content. Today’s agriculture contributes to increased nutrient leakage and the deterioration of soil fertility. In addition, it requires major efforts to protect plants and manure. The benefits of perennial (perennial) crops are many – from reduced energy consumption, land packing and reduced nutrient leakage, to better defence against drought and increased carbon storage in the soil. During the summer of 2018, the Swedish University of Agricultural Sciences began a major attempt to improve Kernza for Swedish conditions at Torsåker farm in collaboration with Axfoundation. The principal researcher is Anna Westerbergh, Associate Professor of Genetics and Plant Processing at the Department of Plant Biology at SLU in Uppsala. Regenerative agriculture is not an individual measure but rather a combination of different cultivation methods that together create a whole that is ‘greater than the sum of the parts’, thus contributing to reduced climate impact. By applying the method, moisture in the soil is better preserved, reducing the risk of drought and erosion. Land mortality improves and soil levels in the soil increase. 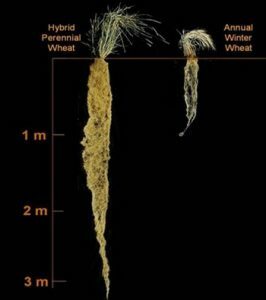 The method also revives the carbon and water cycle so that excess carbon dioxide in the atmosphere is moved down into the ground where it benefits. At Torsåker we have contact with researchers and farmers who apply regenerative agriculture and gather Swedish and international expertise to drive the issue forward.